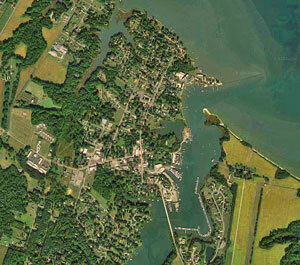 Urbanna Virginia is located on the Rappahannock River, in Middlesex County on Virginia’s Middle Peninsula. The town was established as a port for the shipment of tobacco to England. Urbanna’s tobacco warehouse, listed on the National Register of Historic Places, was built in 1766 and serves as a visitors center today. Seven buildings in town have been in continuous use since the Colonial Period. The Urbanna Courthouse, also listed on the National Resister of Historic Places, was built in 1748 and is one 11 colonial era courthouses still standing in Virginia. Where to Stay? Find the best deal, compare prices, and read what other travelers have to say about hotels, inns, and bed & breakfasts, in the Urbanna area. There is trolley service to get you around town and to and from spots that are a little further out, such as Bethpage Camp Resort, Waterman’s Park, and the Town Marina. There are two public parks in town, Taber Park on Rappahannock Avenue and Waterman’s Park at the end of Colorado Avenue (at the intersection with Kent Street). Taber Park, with a playground, tennis courts, swimming pool, and a large grassy area is the location of the town’s farmer’s market and outdoor concert series. Waterman’s Park has a lovely waterfront location and tables available for picnics. Bethpage Camp-Resort is a favorite Urbanna destination, see visitor reviews. This campground and RV park is considered the best in Virginia. Amenities include a water park, swimming pools, miniature golf, sandy beach, marina, and boat rentals. Urbanna has several bed and breakfasts and restaurants and cafes. The Urbanna Farmers Market is held on the second Saturday of each month, May through September in Taber Park, at the corner of Rappahannock Avenue and Virginia Street. The popular Urbanna Oyster Festival is held in November of each year. This annual event features oyster specialties and other Chesapeake Bay seafood, a parade, a fine arts exhibit, and visiting tall ships. The event attracts some 75,000 visitors a year. Food and craft booths number over 125 and the Fireman’s Parade features approximately 100 engines of every size and description. The Oyster Festival Parade on Saturday features numerous marching bands, antique cars, equestrian units, locally produced floats and the Khedive Temple Shrine Club of Norfolk. Atherston Hall Bed and Breakfast. A restored schooner captain’s home, located just steps from the waterfront. The Chesapeake Inn. A boutique hotel with thirteen suites, located in the heart of Urbanna. See real estate listings in the Urbanna area. Urbanna Virginia Dining, Shopping, Lodging, Real Estate and Professional Services. Southside Sentinel A weekly newspaper published in Urbanna. Oyster Festival. The site for official Urbanna Oyster Festival information.